On Jan.5, the Yemeni army and popular forces loyal to the Houthi movement thwarted an attempt by the Saudi-led coalition’s forces to enter Yemen from the Jizan province through the border crossing of Tawwal. According to the reports, both sides suffered causalities. The clashes in this area have been especially heavy since the Houthi alliance captured the villages of Khobe, Qarn and Sahabakh inside the Jizan region of Saudi Arabia on Jan.4. The several coalition combatants were also killed. The Saudi military base in the Alhajleh region of Najran province came under the Houthi forces’ attack. The pro-Yemeni sources argue that the Houthi forces killed tens of Saudi military servicemen and captured the military base. In a separate development, the Houthis captured the village of Al-Huwaymi in the Al-Lajh province in Southern Yemen. Now, the Houthi forces are advancing to the town of Kirsh. 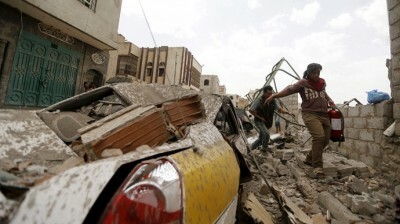 The Saudi Air Force launched a number of airstrikes over the Yemeni capital of Sanaa on Tuesday morning. Over 40 civilians were killed and wounded and several civilian sites were damaged. Separately, the Saudi warplanes conducted air raids in the Yemeni province of Sa’ada. On Jan.5, Hassan Hamoud Uqlan, a known field commander of ISIS in the Tha’bat district of Ta’izz Province was killed in the clashes with fighters of the Houthi movement and military units. Openly, ISIS controls only separate areas in Yemen, however, a significant incensement of the terrorist group’s activity have been observed since the start of the Saudi-led coalition’s military operations in the country.